A Swedish court has blocked construction of David Chipperfield's £100 million Nobel Center in Stockholm, stating that it would cause "significant damage" to the city's historic waterfront. Chipperfield's firm was left reeling after Sweden's Land and Environment Court ruled against plans to build cultural centre and permanent home for the Nobel Prize. "Obviously this is not the verdict we were hoping for, and [we] are naturally disappointed," said a statement from David Chipperfield Architects' Berlin office. The design, proposed for Stockholm's Blasieholmen peninsula, is for a building featuring a golden facade of brass louvres and a glazed ground floor fronting a new city park. 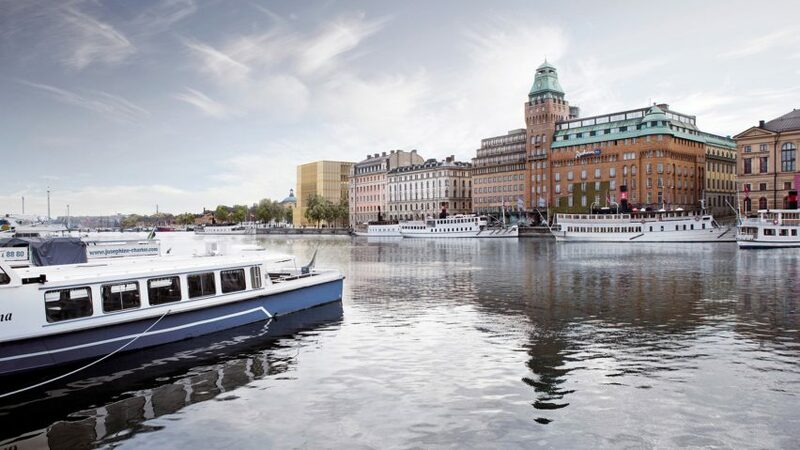 But the court ruled that the scale of the building would significantly impact "the readability of Stockholm’s historical development as a port, shipping and trading city". The ruling, on 22 May 2018, makes the future of the project uncertain. But, according to David Chipperfield Architects, the City of Stockholm will appeal the decision. "We fully respect the open and transparent process negotiating the legal framework for the Nobel Center. Together with our client, we will seek to understand this in greater detail," said David Chipperfield Architects. "It is our understanding that the City of Stockholm will appeal the verdict and we hope that during this process the very public nature of the Nobel Center will become clearer, highlighting the necessity of creating places dedicated to dialogue and debate for the stability of our civic societies, especially in these times, and how it can enrich the cultural and social life of Stockholm." David Chipperfield Architects won the competition for the project back in 2014. The aim was to create a building to host future Nobel Prize ceremonies in the fields of sciences, literature and economics. Along with an auditorium for presenting the prizes, the building was designed to contain exhibition, education, conference and hospitality facilities, with a restaurant and bar placed on the top floor. The initial scale of the cultural centre concerned some members of the public, leading to reports that the building would be scrapped. Practice founder David Chipperfield responded by accusing newspapers and trade publications of presenting minor issues with buildings as major setbacks. Following consultations with local residents and stakeholders, the architects "significantly reduced" the size of the building. A further revised version of the building, with small changes made to the building's shape, was presented to the public in 2016 and subsequently approved by Stockholm's City Planning Committee. This was followed by an approval from the Stockholm County Administrative Board in 2017. David Chipperfield Architects ranked at number 42 on Dezeen Hot List 2017. The firm recently completed the renovation and expansion of the Royal Academy in London, and is also working on plans to overhaul the Minneapolis Institute of Art.